If you or your business needs an industrial strength pressure washer, you’ve landed on the right page! 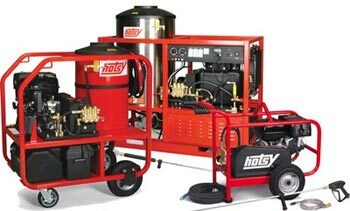 Hotsy Cleaning Systems, Inc. is the factory-direct dealer for Hotsy pressure washers in Wisconsin, also serving Michigan’s U.P. Since 1972, our customers in industries such as manufacturing, paper mills, food processing, milking parlors, ag repair shops, fork lift dealers, trucking, breweries, truck repair shops and construction count on us to provide quality cleaning equipment. If you want unparalleled cleaning power, with over 35 years of engineering expertise, consider a Hotsy pressure washer. With the best warranties in the industry, Hotsy offers a 7-year warranty on the high-pressure pump and a 5-year warranty on the heating coil. The first decision is to choose what type of pressure washer you need. Hotsy pressure washers fall within two main categories – hot water and cold water. Both are industrial-strength and are available in portable and stationary models. All Hotsy pressure washers are ETL certified to UL-1776 standards, which means they meet stringent bid and application requirements for safety. For pricing and further specifications, please contact a staff member at Hotsy Cleaning Systems, Inc. We have satellite locations in Madison, La Crosse, Eau Claire, Wausau, Green Bay as well as our main location in Delafield. We have the hands-on knowledge and expertise that only 30 years of experience can bring – you won’t find a more knowledgeable team. Hotsy pumps are equipped with a industry leading 7-year warranty on the high-pressure pump.